The Minerology Museum and some royal emeralds. The best of what’s left of the French Crown Jewels – most of which were sold off by the Third Republic in the late 19th century to mark the end of empire – can be seen in the Louvre, but some of them were distributed to two other French museums: the National Museum of Natural History and the Musée de Minéralogie (60, boulevard Saint Michel, 75006 Paris). The latter, hidden away in the Ecole des Mines (France’s elite engineering school), has created a new display for its royal gems. Visitors who expect elaborate crowns, necklaces, etc. 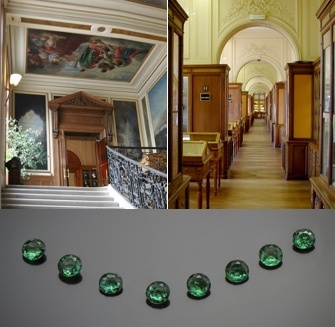 (those can be found at the Louvre) will be disappointed: the Minerology Museum’s beautifully cut amethysts, topazes and emeralds have lost their settings and are displayed on their own. Never mind, this wonderfully old-fashioned and more-or-less forgotten museum offers a nostalgic journey back to school trips with its wood-and-glass cases filled with marvelous rocks.